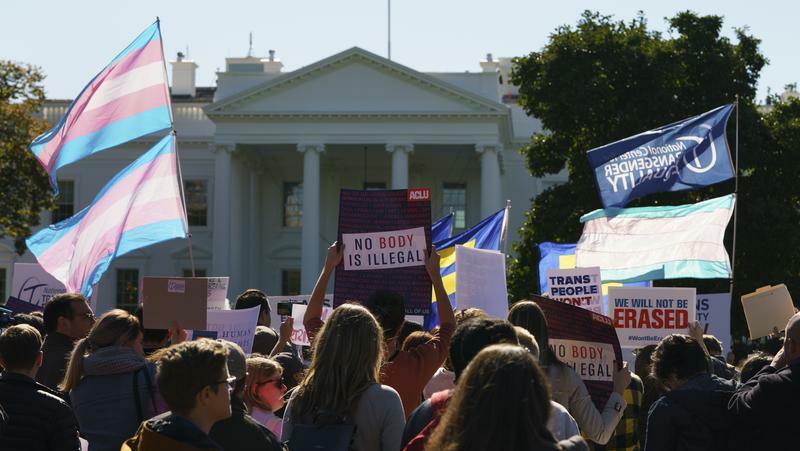 Activists gather in front of the White House on Monday, Oct. 22, 2018. BOB GARFIELD: This is On the Media, I'm Bob Garfield. On Election Day, Massachusetts citizens will weigh in on a referendum known as Question 3. A yes vote preserves existing protections for trans individuals against discrimination in public spaces. A no vote returns the state to its pre-2016 status quo in which transgender was not a legally protected class. The messaging on the no side of Question 3 has featured the sort of scare tactics you might expect in such a key battle within the American culture wars, including this attack ad produced by the NO on 3 campaign. BOB GARFIELD: It's an almost comically anti-trans video but in a remarkable exercise in political homeopathy. The activists on the other side of the question, many themselves trans, went door to door to share that ad with potential voters. It was not a random tactic it emerged based on the work of Stanford professor David Broockman. Who–a few years ago in Florida, on another trans related ballot question –began applying his research findings to supercharge the age-old political process of door to door canvassing but just plain talking to the person who answers the door. DAVID BROOCKMAN: A lot of people have skepticism about this kind of approach because they say, 'well, there's no way that you could knock on a stranger's door and get them to talk to you, much less tell these kinds of stories.' But what we actually found in the research is that canvassers who had just gone through a simple morning training were able to have conversations where the vast majority of voters who were home, open the door, had the conversation and told a story from their life. So I think our fellow Americans are actually remarkably open to reflecting and thinking about their political views, about these kinds of topics, if they're approached in such a way from a friendly person who is open and wants to have that kind of conversation with them. BOB GARFIELD: So once you've initiated the perspective having, what's the effect? The person becomes suddenly more open to other outgroups like trans citizens. DAVID BROOCKMAN: Just like clinical trials for medicine where you'd randomly assign patients to a blood pressure pill or a sugar pill, we did the same thing in the study where we randomly assigned voters to either get the kind of perspective taking intervention that I mentioned or a control group that got a door knock about recycling. What we find when we do a series of follow up surveys–three days, three weeks, six weeks and three months later–is that when we compare the group that we had the conversation with at the door versus the group we could have but did not. That treatment group is significantly more accepting of transgender people across a variety of items. The average effect is on the order of about 15 percentage points if you had to put it in those terms. Another way to think about it is that if you look at the change on items that measure attitudes towards gay men and lesbians and the average attitudes in 1998 and 2012, we see a similar effect from these 10, 20-minute conversations as we see in the public in general from 1998 to 2012. So that's a really, really big effect. BOB GARFIELD: Does this inoculate them against political advertising that engages in hateful hot button presser? DAVID BROOCKMAN: One thing we actually did and one of the follow up surveys is actually show the voters in both the treatment and control groups one of those transphobic advertisements to say, 'well if we show them these ads, is the effect of the canvass going to say go away as everyone retreats into a transfer the corner?' Although we do find the ad has some immediate effect, we still find the treatment group we canvassed is much more supportive. Moreover, several weeks later, it seems as though the effect of the ad has completely evanesced. What we find time again is that the effects of those kinds of mass media advertisements are very ephemeral. BOB GARFIELD: Now doesn't your research fly in the face of academic orthodoxy on the matter of campaign theory? DAVID BROOCKMAN: We're actually entering this really interesting period which is sort of like when medicine moved from putting leeches on people and telling anecdotes like, 'well I put a leech on Mary and Mary got better so you should put a leech on yourself too.' We're kind of still, I would say, in the early days of using these rigorous real-world randomized trials that revolutionized medicine. So there's different versions of orthodoxy depending on who you subscribe to. But my personal view is that we actually just know remarkably little about the real world impacts of this kind of campaign activity. I don't think our study is going to be the last word on the matter. It's much more like one of the first words on the matter of this particular kind of intervention. But we're doing lots of follow up work on other issues like immigration, abortion, to kind of flesh out our understanding of this. TV campaigns reach a lot, a lot, a lot of people and door to door canvassing is limited in the number of volunteers you have to fan out in a community which is why the campaign industrial complex is built around television advertising. So let's say the effects that you found in your studies hold true through subsequent studies and become the received wisdom of political campaigning, there's still the problem of, of seeing enough individual voters at their doorsteps to really have any effect. DAVID BROOCKMAN: There actually are plenty of political campaigns. The Bernie Sanders campaign in 2016, the Beto O'Rourke campaign right now in Texas and many others who have succeeded in recruiting just a huge number of volunteers to go talk to their neighbors and knock on doors. So from my perspective. if campaigns don't try and really think about the art and science of recruiting volunteers and building a team to talk to their neighbors, then it's no surprise that if they don't make a good try at it they're not going to have much success. And in terms of the dollars and cents of it, I think it's also a vision of American democracy that normatively we might like a little better too. You don't need a big campaign budget or to do lots of fundraisers with rich donors to be able to bankroll a serious field team. What you need is a candidate or a cause that many kinds of engaged individuals want to go volunteer their time to spread the word about. BOB GARFIELD: In two weeks time we'll know how Massachusetts voted on Question 3, will that tell us anything definitive about inoculation? Is there some way that we could find ourselves on sounder statistical footing on the subject of inoculation? Or are we going to have to wait for, still, more peer-reviewed social science to materialize? BOB GARFIELD: Yeah but just between you and me, should I be like investing heavily in clipboard futures? DAVID BROOCKMAN: Well, I think what we tend to see in other industries is that as new ideas and innovations come out of academia, they diffuse over time and relatively slowly into the real world. So I don't know that I think that campaigns will or even necessarily should be taking this one study we have and now reorienting all their activities around it within the next year. I hope on the scale of 10 or 20 years, we'll have built up the kind of evidence base that is very persuasive and rigorous and that prejudice reduction advocates will be interested in applying and their work. BOB GARFIELD: David, thank you so much. DAVID BROOCKMAN: Sure, thank you. BOB GARFIELD: David Brockman is a political scientist at the Graduate Business School of Stanford University. Matt Collette has been reporting on the Question 3 campaign for the WNYC podcast Nancy. Matt welcome to OTM. BOB GARFIELD: All right, so in the late summer you went up to Massachusetts and you tagged along with the door to door campaign in support of Yes on Question 3–that is to say yes, keep these laws on the books. What did that campaign look like? MATT COLLETTE: So it's this like super enthusiastic, super grassroots organization, which is the word people use a lot but like these volunteer sessions began and ended with things that sort of doubled as training sessions and like we're all gonna be okay group therapy sessions. ORGANIZER: So here is a tip for you as you head out on the turf. One is: be tenacious, which means going and if someone comes to the door, assume that they are interested enough to answer the door. So don't give them a space to say no or to say I'm busy. So instead of saying, 'do you have time,' Just launch into your script. DEE: Hey, good morning. I'm looking for Beatrice or Joseph. DEE: Oh that's fine. My name Dee, I'm with the Yes on 3 campaign which is that campaign to protect transgender equality in Massachusetts. DEE: I know that this is an issue that's been getting a lot of attention lately in like the press and just sort of in general. Have you heard anything in the news or on social media or just enough face to face conversation that's giving you any hesitation or doubt about your vote? DEE: They made an ad just about this. And love to show it to you. VIDEO VOICEOVER: Vote no on 3. This bathroom bill puts our privacy and safety at risk. It goes too far. DEE: What did you think about that? Does this is raising concerns for you? BEATRICE: No, but in a way, not to offend transgender people or whatever you want to call us... It would be better, I think both,got both sides to have their own bathroom. BEATRICE: So, in other words. You people are going to be criticized or whatever– name calling, whatever they want to do–and there people that are just able to keep their mouth shut. DEE: Right. I hear what you're saying. So you're sort of saying that transgender people should have their own place to go just so that they can kind of be spared from people who may have a problem with it. BEATRICE: Yeah, I think places like that, so transgender doesn't get upset or somebody doesn't stop yelling, screaming from police or whatever. BOB GARFIELD: When the canvasser Dee left Beatrice's house, what was the net-net of the conversation? MATT COLLETTE: So at the end, Dee has to ask the same question she asked at the beginning, how are you going to vote on this? DEE: When our, this, the non-discrimination laws on the ballot, will you vote yes to keep these protections or vote no to repeal them? DEE: Vote yes? And would you say, 'definitely yes' or 'probably yes'? DEE: –I really appreciate it. MATT COLLETTE: How do you feel about that went? DEE: It Went well. What she was saying about having different restrooms for transgender people like the words like separate but equal across my head and that's not really necessarily the right argument to bring to her because it's you know we don't want to be too confrontational while we're doing this work. Because we can't you know we can't bring somebody all the way. But she was somebody, she was, she was a nice lady definitely a good conversation. MATT COLLETTE: Where to next? MATT COLLETTE: I don't know, I left feeling a little more skeptical. Some conversations I definitely felt certain. I was like get this sort of inoculation idea has happened but I think a lot of times it can be messy and you leave people with like a storm of ideas that maybe aren't completely resolved and some of it like you're not going to resolve them 10 or 15 minute conversation with a stranger at your door. And maybe it planted a seed, and now as Beatrice sees this in the news, sees it on the newspaper, sees a commercial like this, she'll understand the context to which it exists but it's also possible that she'll never really think of this again. BOB GARFIELD: Now this is all an interesting bit of political science and campaign strategy speculation at the moment, But it's also something particularly of the moment. The Trump administration apparently is working on a workaround so that transgender as a category of citizen effectively will cease to be. And then, therefore, any particular protections rendered moot. Does that add urgency to the Question 3 campaign? MATT COLLETTE: My theory going into this–and what I heard from people on the ground there–is that basically if this loses in Massachusetts, anti-trans activists all over the country can go around and they can say, 'if liberal Massachusetts doesn't want these protections, why should we have them in Wyoming or West Virginia or anywhere that these come up for debate.' So. BOB GARFIELD: Too far the mainstream even for the People's Republic of Massachusetts. MATT COLLETTE: Exactly. I think the other thing is that it took a long time for the gay rights movement to get to a point where they had majority support. It can be really hard to get a majority of people to vote for a minority especially if they don't know them or if they don't understand them. The trans community is so much smaller than the gay and lesbian community. I think it can be even harder to move the needle. So if a strategy like this inoculation thing works or at least shows us a new angle that, that might be able to be taken in the LGBT and queer rights movement, it's promising. I don't know that it might work as well on an issue like abortion that a lot of people have thought a lot about and made up their minds. I think that's where the research wants to see where you can continue this. Right now, I think it works on something that people haven't actually given a lot of thought to in the first place. BOB GARFIELD: Matt, thank you very much. MATT COLLETTE: Thanks so much, Bob. BOB GARFIELD: Matt Collette is the senior producer of Nancy a podcast about all things LGBTQ made right here in our producing station WNYC. That's it for this week's show On The Media is produced by Alana Casanova-Burgess, Micah Loewinger, Leah Feder and John Hanrahan. We had more help from Asthaa Chaturvedi and Samantha Maldonado. And our show was edited this week by our executive producer Katya Rogers. Our technical director is Jennifer Munson. Our engineers this week are Sam Bair and Josh Hahn. Jim Schachter is WNYC vice president for news. Bassist composer Ben Allison wrote our theme. On The Media is production at WNYC Studios. I’m Bob Garfield. 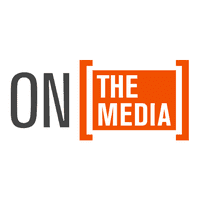 FEMALE CORRESPONDENT: On The Media is supported by the Ford Foundation, the John S. and James L. Knight Foundation and the listeners of WNYC Radio.